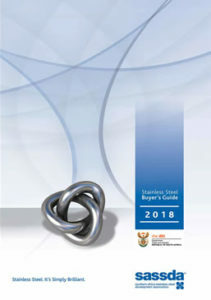 The 2018 Stainless Steel Buyers Guide is available from Sassda in both digital and print format. Hard copies are sent to end-users, such as Engineers, Specifiers, Architects, International Embassies, etc. The Stainless Steel Magazine provides all members with the opportunity to advertise in the magazine and provide editorial. Technical Support is provided at no cost to all members and end-users. Should the enquiry require more in-depth investigations, then a fee is agreed upon. The Cross and Balls Emblem is provided to all paid up members for use on their promotional materials and products. The emblem is widely recognised as a symbol of quality and trustworthiness. Sassda is seeking to embark on a brand activation exercise to allow our members to further exploit this opportunity and leverage off this promotion. As an Association representing the stainless steel industry, Sassda ensures that it undertakes Lobbying on behalf of the industry. Sassda is currently working on a lobbying strategy to ensure that the industry remains a robust and competitive industry. Industry issues are taken up with relevant ministries and governmental agencies.